As the first day of Spring approaches and Spring cleaning comes to mind — why not start with your floor covering! 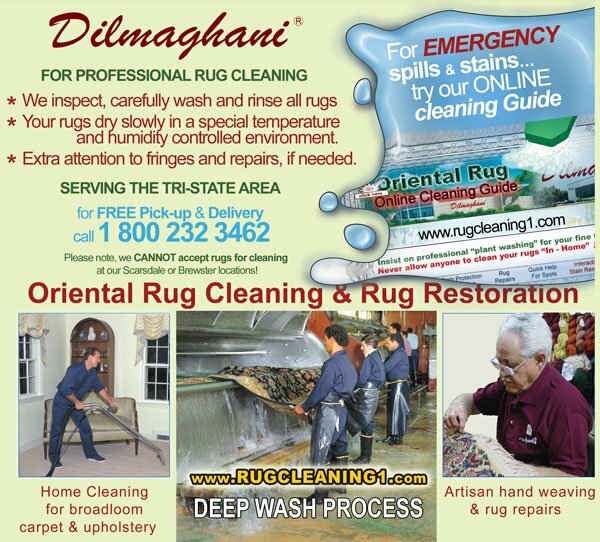 Dilmaghani is a partner with a fine rug cleaning factory serving the tri-state area. We pick up your rugs, take them to the rug cleaning plant and return them to your home! Simply phone: 1-800-232-3462 and a Dilmaghani representative will explain and make your arrangements. Dilmaghani’s rug cleaning plant provides free pick-up and delivery within a good portion of the Tri-State area. Summer is the perfect time for cleaning your Oriental Rugs ! Check our website’s rug cleaning page for specifics about the variety of washes available and suitable to your hand knotted rugs. For contact, phone: 1-800-232 3462.